Spotted on a board at the Wien-Speising station of the Vienna S-Bahn that informs riders of service changes. Planning your travel please consider the actual information. The actual is probably the result of a bad attempt by the ÖBB (which runs the S-Bahn) to translate aktuell, which means current. However, interestingly, the German version of the message doesn’t use that word. I am happy to report, however, that, unlike last year, I didn’t see any signs by the Wiener Linien wishing everyone a “Happy New Jear” this New Year’s. Ducking from and slipping on handbills is going to be a thing of the past on one side of Mariahilfer Straße, Vienna’s busiest shopping street. Why only one side? Because the street forms the border between two of Vienna’s districts, and only one of these has banned their distribution. Mariahilf, Vienna’s 6th District, run by the Social Democratic Party, recently decided on this ban, to be enforced after a couple “information days.” Neubau, Vienna’s 7th District, run by the Green Alternative, has not voted on such a ban. Seeing that it’s the Green Party, however, it’s doubtful that handbills won’t also be banned on their side of the street soon, as otherwise it would be twice as littered as it is now. I don’t really know why I mentioned this, but it seems like a humorous case of inner-Vienna politics. Additionally, I really hate handbills… Intensely. Especially on Saturdays, it’s impossible to walk down Mariahilfer Straße without having arms fly at you from every angle with some dumb handbills (often given out in sets of two or more so the distributor gets done quicker) advertising some junk you’re not interested in. I’m pretty sure around 15 percent of the flyers end up in the nearest trashcan, and all but one percent or so of the remainder end up on the street. The end result is a scene like the one in the random photo of a street in Miami that I have attached to this entry (I couldn’t find one depicting the situation on Mariahilfer Straße). 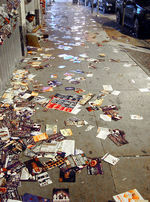 “Image:Flyers sobe 2.jpg”. Author: Wikipedia user Ld. Modified by Wikipedia user ArtMechanic. Permission is granted to copy, distribute and/or modify this document under the terms of the GNU Free Documentation License, Version 1.2 or any later version published by the Free Software Foundation; with no Invariant Sections, no Front-Cover Texts, and no Back-Cover Texts. The first air-conditioned subway cars in New York City began operation in 1967. The Vienna subway opened twelve years later, in 1979, and none of its brand-new cars were air-conditioned. In 1987 the next generation of subway cars were rolled out (they look almost identical to the first ones), but these weren’t air-conditioned either. Finally in 2000 a prototype of the third generation was rolled out, and it’s air-conditioned. It won’t be until late this year before more of these start rolling out, however.